Children crave our attention. They constantly bid for our interactive presence in their life. They want us to join them in their world—to become present in their life, and to remain aware of their presence in our life. And, our children will do whatever it takes to make sure they maintain our attention. You have experienced this, I’m sure. Your child is sitting quietly in a room doing their own thing. The phone rings and you begin a conversation with one of your friends. Suddenly, your child wants to ask you questions…they need your help…they want to talk. You ask them to leave you alone for a moment while you talk on the phone. The next thing you know, they are picking up your crystal vase or doing cartwheels in the dining room. They have turned into an attention sucking vampire. Underneath all their questions and crazy behavior, they simply crave your attention and will do whatever it takes to get it! But wait…do not read too many negative intentions into this desire for recognition and attention. After all, they really do need us to survive. Children need us for everything from managing their emotions to regulating their impulses to providing them with food. Still, the little attention sucking vampires can drain a parent of energy. So, what is a parent to do? Here are a couple suggestions to help your child develop a healthy level of attention seeking behavior. It begins with us giving them positive attention. Catch ’em being good. I realize this is an old saying and perhaps sounds a little cliché; but, if you practice catching your children being good, their negative attention seeking behavior will decrease. They will learn that you are not only aware of their presence, but you are pleased with their presence in your life as well. They will know you delight in them. If you do not “catch ’em being good,” your children will learn that being bad will definitely get your energy and your complete attention…and negative attention is better than no attention. So, put in the effort to “catch ’em being good” every day. Play with them every day. Take some time every day to engage your children in some playful activity. Let them pick the activity. The activity can range from reading a book to going to a park to playing with dolls. Whatever activity you choose, spend the time focused on your child. Notice their strengths and acknowledge their imagination. Support their creativity. Laugh. Hug. Play. Respond to your children quickly. Do not ignore your children’s requests. Respond to them. You do not always have to say “yes,” but have the respect to respond. 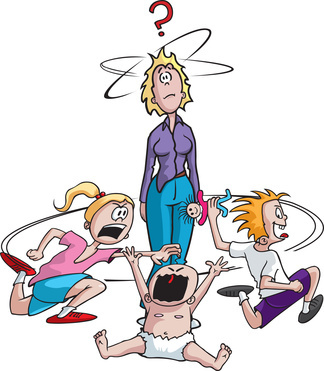 When your children begin to “act up,” respond quickly. If they begin to get angry or frustrated, respond early. Do not let them escalate before responding. If you do not respond quickly, your children will escalate. Their attention seeking behavior will become more adamant and intense. Their frustration will become a tantrum. Their “acting up” will quickly get out of hand. Why? Because they have learned that they have to escalate to get your attention. When you respond quickly, your children learn that they have your attention before they escalate. Acknowledge your children’s desire non-verbally when you are busy. If you are talking to a friend and your children come up to get something from you, put your arm around them. If your children begin to tell you something when you are not able to answer in length, simply let them know you will “answer them in a minute.” Then immediately address their need when you can. By acknowledging their presence and their need, you have let them know you are aware of them. They are on your mind. By addressing their need as soon as you can, you build trust. Your children learn to wait because they can trust you not to forget them in the process. These four suggestions can help turn your cute little attention sucking vampire into a teddy bear, a child who knows his parents delight in him and hold him in mind. He will trust his parents to provide the attention he needs and seek that attention in more positive ways.